New CCTV cars to catch drivers using their mobile phones or being otherwise distracted at the wheel are being piloted by Greater Manchester Police. 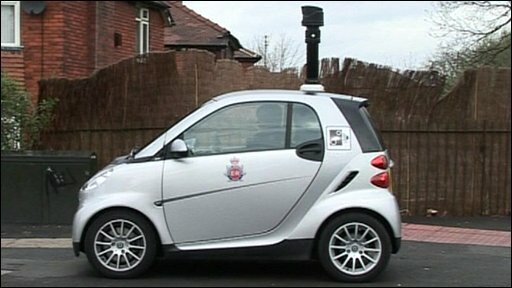 The small Smart cars, which have a 12ft (3.6m) mast with a camera attached, are parked at junctions to monitor traffic. Mike Downes of the Greater Manchester Casualty Reduction Partnership said the scheme was successfully "driving the number of accidents down". But the AA's Paul Watters said drivers "might regard it as Big Brother". Two cars are currently being piloted in Greater Manchester, among the first of their kind in the UK. Anyone seen driving while distracted - eating at the wheel, playing with the radio or applying make-up for instance - is filmed by the cameras. Later, a letter is sent to the owner of the car, in many cases along with a fine. Anyone caught using their mobile will be asked to pay £60 and have three points added to their licence. Fines could also be handed out to anyone who is thought to be driving without due care and attention, or similar offences. According to the Partnership - also known as Drivesafe - there have been 406 collisions in Greater Manchester in the past two years which can be attributed to distracted drivers. Of those, 51 were said to involve the use of a mobile phone as a significant factor. Mr Downes said the cars would only trace people who are committing an offence. "The camera is only trained on the vehicle to secure the evidence," he said. "I would say the actions we are taking are reasonable, proportionate and fair in light of the fact that we are trying to save lives." The scheme is only a few weeks into the pilot, so figures on the numbers of people who have been caught using this technology are unavailable. But the CCTV cars have already attracted criticism from people who argue they are an infringement of people's privacy. Paul Watters from the Automobile Association (AA), said he had reservations about the cars, and would watch the pilot scheme with interest. "CCTV enforcement lacks connection with the driver until after the event and some drivers might regards it as Big Brother. "We think that most drivers would prefer police in cars to dish out tickets on the spot and instil better driving behaviour," he said. If the scheme is seen to be a success in reducing the number of accidents, those behind it hope it could be rolled out across the UK. Some councils already use Smart cars with cameras to track parking and bus lane offences.